Hail damage is one of the most common reasons homeowners file a claim with their insurance company. That’s because even a short hailstorm can severely damage your roofing shingles in Alpharetta. Hail consists of hard pellets of frozen rain, which is why it’s not surprising that its impact can be so detrimental for your roof. In fact, shingles are very vulnerable to hail, but the signs of hail damage aren’t always easy to detect. Asphalt shingles can easily be damaged by hail. That’s because these shingles contain ceramic granules that are supposed to protect them from the sun’s rays. It’s natural for granule loss to occur over the lifetime of the shingle. However, during a hailstorm, the impact creates soft spots on your shingles and loosens the granules. After the granules are loosened, they can get washed away fast. Your shingles are impacted in other ways by hail, too. For example, the fiberglass mat may become exposed or fractured, although that’s not always visible to the homeowner. The storm can also loosen the integrity of the seal, which makes it more likely for the shingles to fly off the roof in the future. Lastly, there may be some cracks in the surfacing of the shingles. These cracks can occur if the wind blew the shingles backward, causing them to bend unnaturally. 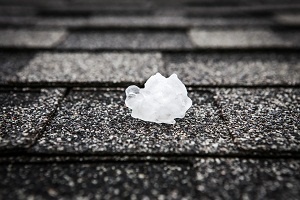 For a roofing expert, it’s easy to notice signs of hail damage. However, homeowners have to know what to look for. There may be soft spots or bruises where the shingles were hit by hail. You may also see granules from the shingles in the yard or inside your gutters. When the granules fly off the shingles, it’s not just a cosmetic problem. The integrity of your shingles is now at least partly destroyed. Hail damage can also be noticeable in other areas of your house. For example, you may notice holes in in your window screens, dents in your gutters, or damaged flashing on your roof. Some shingles may even be broken or missing entirely as a result of the storm. 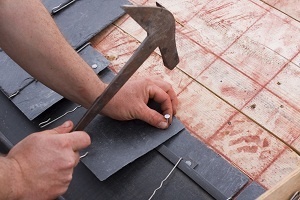 In some cases, you may be able to replace or repair the shingles that are broken. However, extensive hail damage can require a new roof, too. In some cases, your homeowner’s insurance may cover the repair or replacement of your roof. However, the first step will be to talk to a roofing expert to determine the precise amount of the damage and how you can get it fixed.